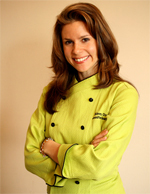 Skinny Chef® was launched in April 2003 by Jennifer Iserloh. Jennifer is CEO of Iserloh Ventures, a passionate advocate for delicious and easy-to-prepare meals, and a recognized healthy cooking expert. As a trained chef, author and health expert, Jennifer has created thousands of delicious recipes, articles, and blogs posts for TV, print and web publications including The Today Show, Living Well With Montel, SELF, Prevention, In Style, People, First For Women, AOL KitchenDaily, and LiveStrong. In addition to her own books, Secrets of a Skinny Chef (Rodale, 2010), Yoga Body Diet (Rodale, 2010) and Active Calorie Diet (2011), she was also the recipe developer for Elisabeth Hasselbeck's Deliciously G-Free (Random House, 2012), Jessica Seinfeld’s Double Delicious (2010) and Deceptively Delicious (2007), as well as Joy Bauer’s Food Cures (2007). After graduating with honors from the Institute of Culinary Education, (formerly Peter Kump’s) Jennifer was invited to intern with Chef Scott Bryan, former chef owner of Veritas restaurant. While there, she met Tyler Florence of the Food Network. Serving again upon invitation, Jennifer interned onTyler’s cookbook, Eat This Book , where she learned the essentials of food styling and photography. With Skinny Chef, Jennifer's mission is to show families that healthy cooking can be fresh, fun and flavorful – including techniques from professional kitchens to empower people to take on a bigger role in their own health while enjoying life more. SELF magazine's editor-in-chief Lucy Danziger labeled Jennifer's recipes "A Must-Have In Every Healthy Woman's Kitchen"
Gourmet magazine editor Maggie Ruggiero wondered aloud "Who Thinks Up This Stuff... Crazy And Crazy Good." Jessica Seinfeld said "Jennifer is a wonderful chef who really knows how to simplify home cooking." LiveStrong.com got 350,000 people to watch Jennifer's Food Courting videos. The Active Calorie Diet (Rodale, 2011) is not about what you need to take out of your diet. It’s about what you need to put into it. Along with Prevention editor Andrea Au Levitt and fitness expert Selene Yeager, I created a collection of fat-burning dishes that combine delectable fare with fat burning power built right into your meals. And best of all, it lets you really enjoy the foods you love and lose all the weight you want without counting calories – just like in my 14-Day Kick-Start program.